In 2010, the total revenue obtained in the retail market of mobile telephony services reached almost €14,024 million. In the last year, there was a significant drop of almost 3% caused by both voice traffic and messaging services. 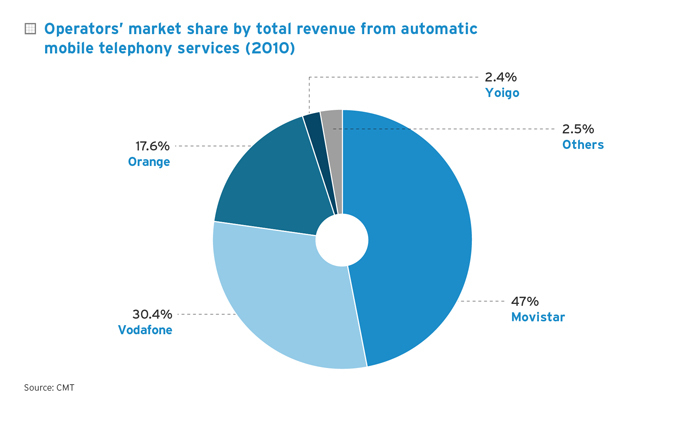 In 2010, Movistar was the operator with the greater market share for final service revenues with 47%, followed by Vodafone with 30.4% and Orange with 17.6%. These values changed slightly, compared to those of the previous year (Movistar dropped 1 percentage point and Vodafone 1.5, while Orange grew by 0.5 percentage points). Yoigo and virtual mobile operators showed a very little market share, with only 4.9% of the total revenue from mobile telephony. Yoigo was the operator that increased its market share the most, going from 1.4% to 2.4%. 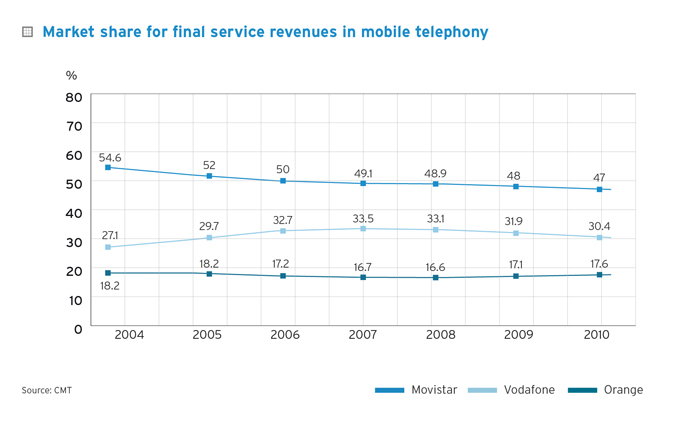 The evolution of the market share for final service revenues in mobile telephony is shown in the graph. It includes revenues from final services and interconnection services.